Joseph Mellord William Turner (c. late April — early May 1775; baptised 14 May 1775, Covent Garden, London, England, Great Britain — 19 December 1851, Cheyne Walk, Chelsea, England, UK) — was perhaps the best-loved English romantic landscape artist, watercolourist and printmaker, whose style can be said to have laid the foundation for Impressionism. Although he was considered a controversial figure in his day, he is now regarded as the British artist, who elevated landscape painting to an eminence rivalling history painting. 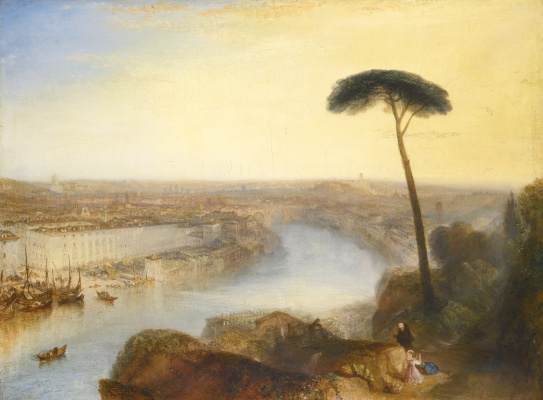 Born in a poor family in London, Turner showed signs of his genius at an early age. He entered the Royal Academy of Art schools in 1789, when he was only 14 years old, and was accepted into the academy a year later. He augmented his studies with other work experience, with architects and architectural draughtsman, including Thomas Malton, whom he later described as "my real master", and painting scenery for the London stage — the origin, presumably, of a lifelong love of music and opera. His entire life was devoted to art. Unlike many artists of his era, he was successful throughout his career. 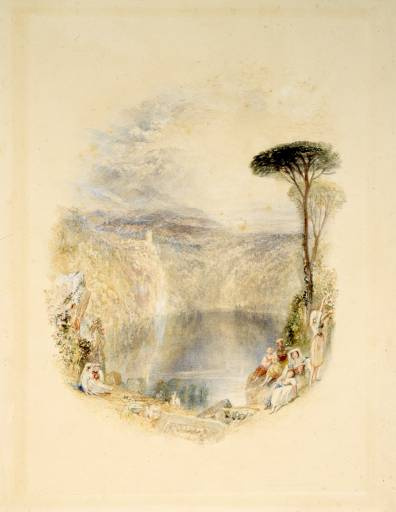 Joseph Turner travelled widely in Europe, particularly in Italy, Germany, Switzerland and France, studying in the Louvre in Paris in 1802. He also made many visits to Venice. In any place, acting as a photojournalist, he made drawings or watercolors, that looked like images, of all kinds of landscapes, sites and monuments. As he grew older, Joseph Turner became more eccentric. He had few close friends except for his father, who lived with him for thirty years, eventually working as his studio assistant. His father’s death in 1829 had a profound effect on him, and thereafter he was subject to bouts of depression. He never married, although he had two daughters by Sarah Danby, one born in 1801, the other one in 1811. He died in the house of his mistress Sophia Caroline Booth in Cheyne Walk, Chelsea on 19 December 1851. He is said to have uttered the last words "The sun is God" before expiring. At his request he was buried in St Paul’s Cathedral, where he lies next to Sir Joshua Reynolds. Turner’s will, which was under litigation for many years, left more than 19,000 watercolors, drawings, and oils to the British nation. Most of these artworks are in the National Gallery and the Tate Gallery, London. Many of his oils have deteriorated badly. Joseph Turner precisely captured architectural and natural details in his early works but in his mature stage, his compositions became more fluid with mere suggestion of movement. These abstractions are considered ahead of his time being a forerunner to the artistic movement Impressionism. He eventually became widely regarded as topographical watercolorist, though he was equally adept in oil and experimented widely with techniques. He received the most acclaim for his depictions of sublime storms and atmospheric, narrative landscapes. Many of his works referenced literature, mythology, and history. 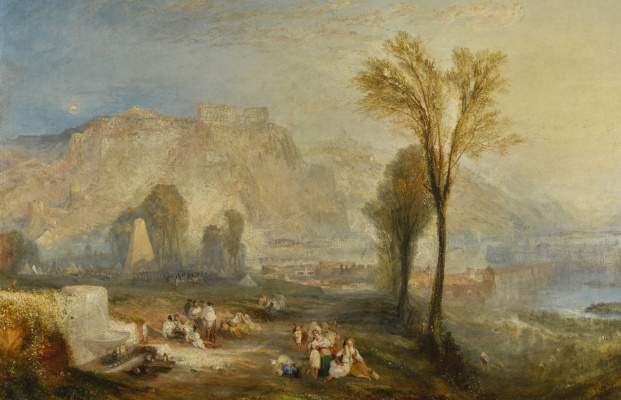 Joseph Turner placed human beings in many of his paintings to indicate his affection for humanity on the one hand (note the frequent scenes of people drinking and merry-making or working in the foreground), but its vulnerability and vulgarity amid the 'sublime' nature of the world on the other hand. His mature work is characterised by a chromatic palette and broadly applied atmospheric washes of paint. His later pictures were called "fantastic puzzles". 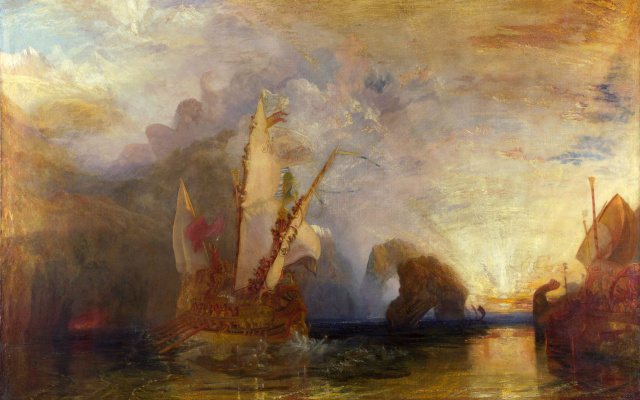 Turner`s most famous paintings are: "Calais Pier" (1803), "Dido Building Carthage" (1815), "Sunrise" (1825−30), "The Fighting Temeraire Tugged to her Last Berth to be Broken up" (1838), "Slavers, Throwing Overboard The Dead And Dying" (1840), "Snowstorm, Steamboat Off A Harbour’s Mouth" (1842), "Peace, Burial At Sea" (1842), "Rain, Steam And Speed" (1844). His early works, such as Tintern Abbey (1795), he used watercolour technique with oil paints to create lightness, fluency and ephemeral atmospheric effects. 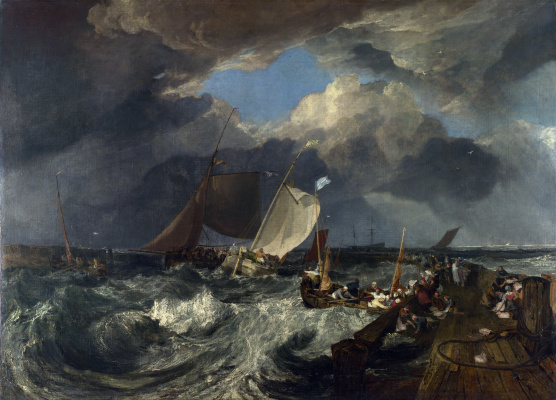 Joseph Turner exhibited at the Royal Academy from 1790, showing watercolours until 1796 when he sent his first oil, Fishermen at Sea, with its marine subject signalling wider ambitions as a painter and his refusal to be typecast as a topographer. 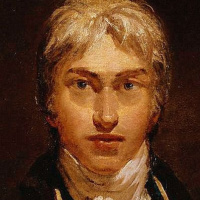 Elected Associate of the Royal Academy in 1799 and Academician in 1802, Joseph Turner was recognised as a prodigy who promised to be the outstanding master of his generation. About this time he painted his self-portrait, rather flattering his looks and attire to signal that he had arrived. Important support for his works also came from Walter Ramsden Fawkes, who became a close friend of the artist. In 1817 he visited Holland and Belgium, to see the battlefield of Waterloo, and the Rhineland; a set of fifty Rhine views in watercolour and gouache was bought by Fawkes. He was fascinated by the violent power of the sea, as seen in Dawn after the Wreck (1840) and The Slave Ship (1840). 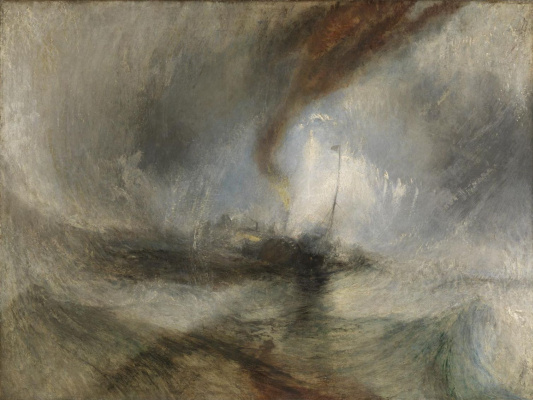 Painting his "Snow Storm—Steam-Boat off a Harbour’s Mouth" (exhibited 1842), Joseph Turner allegedly had himself lashed to the mast of a ship for four hours after it departed in the midst of a snowstorm. As a result this is one of his most abstract statements, visualizing the triumph of atmosphere over what can be seen on land and at sea. Although renowned for his oils, Joseph Turner is also one of the greatest masters of English watercolour landscape painting. He is commonly known as "the painter of light", because of his increasing interest in brilliant colours as the main constituent in his landscapes and seascapes. 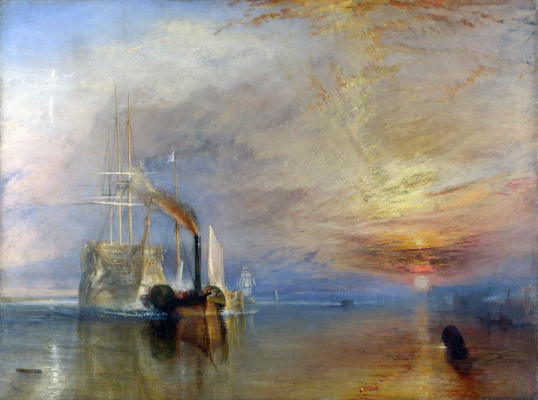 One of his most famous oil paintings is "The fighting Temeraire tugged to his last berth to be broken up", painted in 1838, kept at the National Gallery, London. The significance of light was the emanation of God’s spirit to him, and this was why he refined the subject matter of his later paintings. 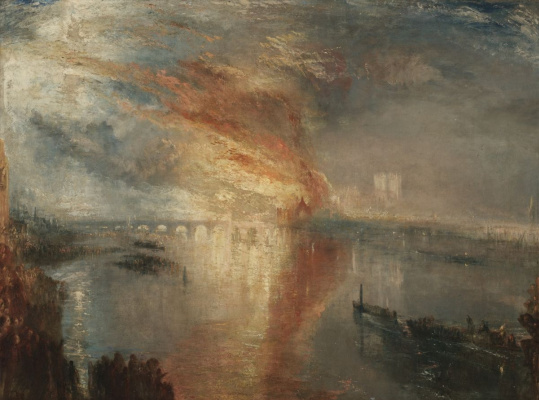 Turner gave less and less attention to detail, and more to the general effects of colour and light (the play of light on water, the radiance of skies and fires.). His compositions became more fluid with mere suggestion of movement. 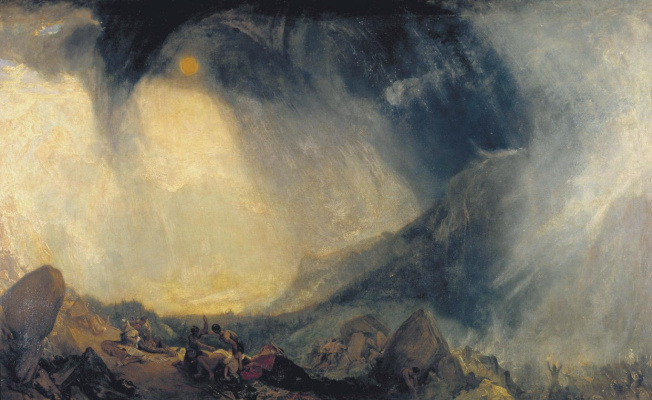 Although these late paintings appear to be 'impressionistic' and therefore a forerunner of the French school, Joseph Turner was striving for expression of spirituality in the world, rather than responding primarily to optical phenomena. In his later years, he used oils even more transparently, and turned to an evocation of almost pure light by use of shimmering colour. A prime example of his mature manner can be seen in "Rain, Steam and Speed — The Great Western Railway", where the objects are barely recognizable. 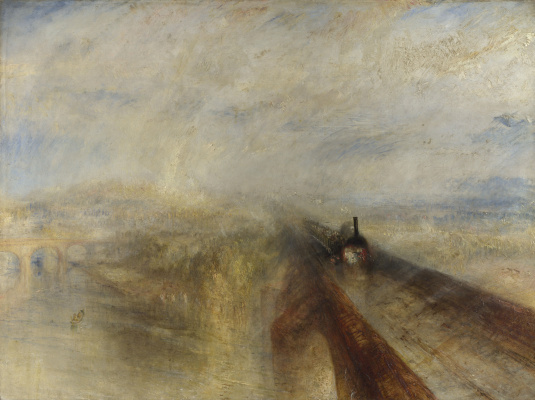 The intensity of hue and interest in evanescent light not only placed Turner’s work in the vanguard of English painting, but later exerted an influence upon art in France, as well; the Impressionists, particularly Claude Monet, carefully studied his techniques. Last voyage of the frigate "Brave"